I love to stock up when Priceline has their 40% off skincare sale (like this previous haul last year) and this year is no exception! Last time they had their sale I posted this, where I suggested a lot of awesome products. And many of them I still adore and use, so check it out for recommendations. But in the last 6 months since I wrote that post, I've found some amazing new products that I wanted to recommend to you for the sale on Wednesday 27th and Thursday 28th of January. It's always great to pick up cleansers as it's one of my most used beauty products. I'm currently using the Trilogy Active Enzyme Cleansing Cream* as my skin is leaning towards the dry side. I use this day and night. 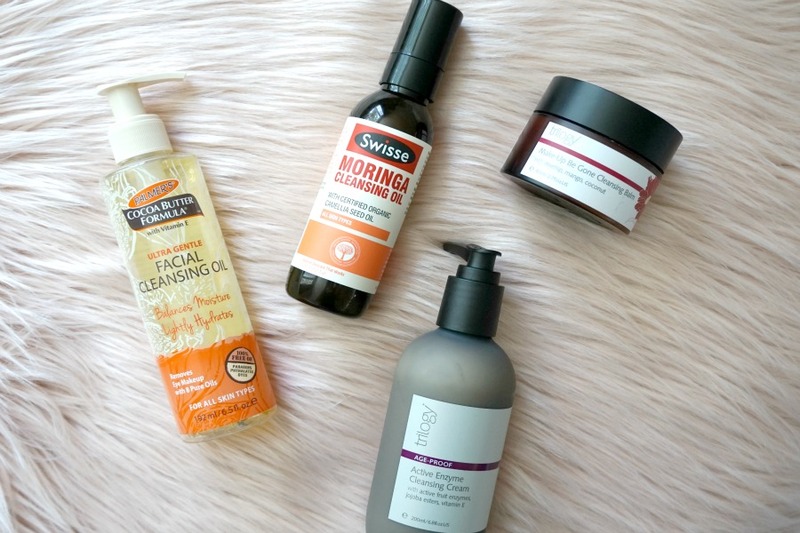 Over the last 6 months, the "drugstore" has killed it with oil cleansers. The Palmer's Ultra Gentle Facial Cleansing Oil is an amazing oil cleanser that is so good that it made it into my Best Discoveries of 2015 post (here). It's a super affordable cleanser that's under $15 and has that beautiful Palmer's scent. It's good for all skin types, even oily skin as it rinses off easily. I use this most nights as I can use it without needing a wash cloth and it removes quickly. Another great oil cleanser is the new Swisse Moringa Cleansing Oil. This one I'd suggest for normal to dry skin, as it does feel heavier and is a little bit harder to remove. I use a wash cloth to help remove the oil but I can still feel a bit on my skin, so it's important to follow up with your normal cleanser to remove all of the oil. If you prefer a cleansing balm then you need to pick up the Trilogy Make Up Be Gone Cleansing Balm. * While I adore this, I don't use it as often as the Palmer's oil cleanser because it's a bit thicker and I need a wash cloth to remove it. I like to reach for it when I've got fuller coverage on. I first started using skincare in the 90s when your routine was only a 3 step system, so I NEVER skip using a toner. I prefer a mist over one you apply with a cotton pad. 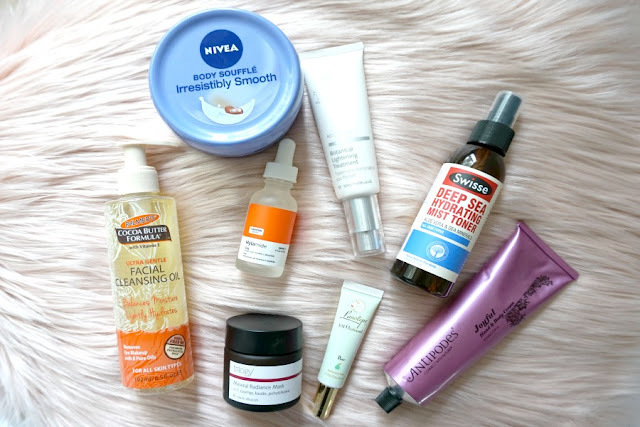 The only exception is the Bioderma Hydrabio Tonique Moisturising Toning Lotion* (not pictured) because it's such an amazing toner. Two toning mists that I've repurchased time and time again are the ModelCo Replenishing Rose Mist Facial Mist and the Avene Thermal Spring Water (not pictured). They're both so refreshing and easy to use. 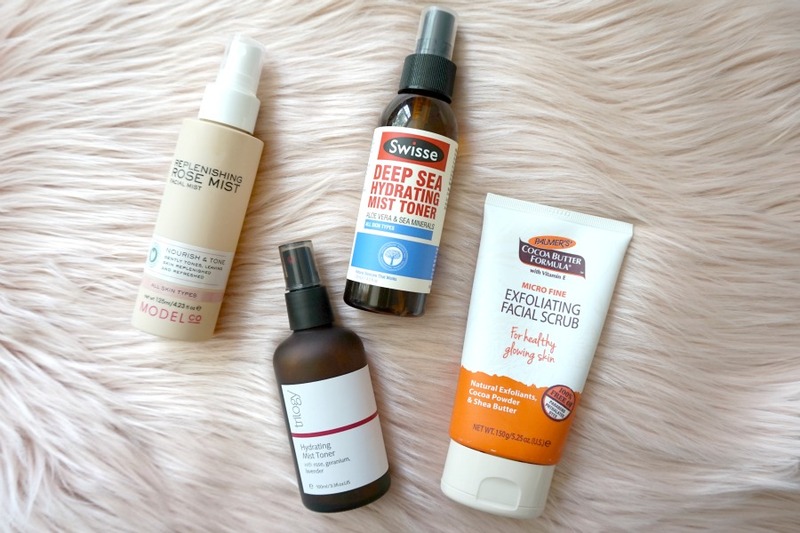 A new one that I've recently fallen in love with is the Swisse Deep Sea Hydrating Mist Toner. I received a deluxe sample in the latest Marie Claire The Parcel beauty box and instantly went out and bought it after using it. It feels so incredibly refreshing on my skin. If you're looking for a toner that smells amazing, then the Trilogy Hydrating Mist Toner* is fantastic. It's main ingredient is rose water, so you know that it has to smell sweet. It's alcohol free and really refreshes your skin. It reminds me of the Jurlique mists, so if you like them pick this up as it's half the price even before the 40% off! I prefer a grainy exfoliator and have been enjoying the Palmer's Exfoliating Facial Scrub. I use it 2-3 times a week and it leaves my skin feeling so soft. 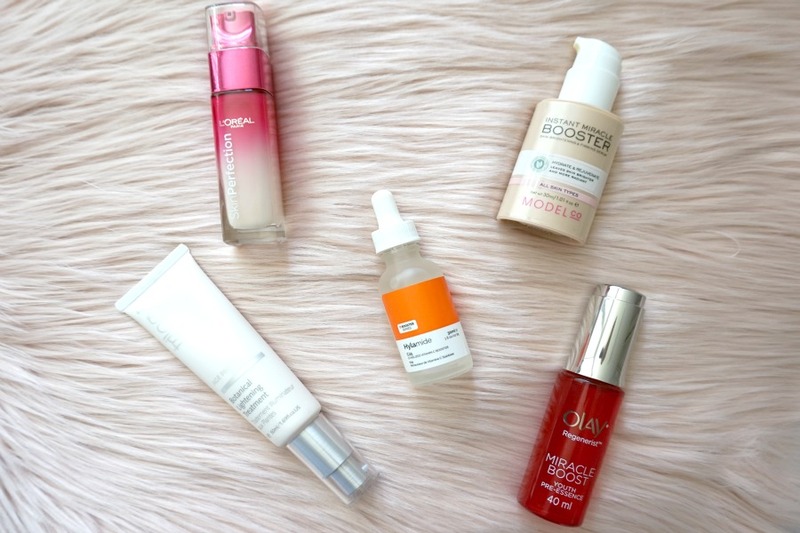 If you've never used a serum then the ModelCo Instant Miracle Booster or the L'Oreal Skin Perfection Serum are great ones to start off with. They're both what I would call an all rounder as they help to brighten the skin and make you glow. I've only just started using the Hylamide Booster C25 this month but I already adore it. It's a vitamin C serum that has a strange consistency. It almost feels like a lightweight, watery oil. It sinks into the skin quickly and works well underneath my serum (I'm currently using the ModelCo serum) and moisturiser. One of my stand out products of 2015 was the Trilogy Botanic Lightening Treatment. It's an amazing serum that really helped to reduce some of my pigmentation. It has a lightweight formula that's perfect for all skin types. If you can be bothered adding in another step, then the Olay Regenerist Miracle Boost Youth Pre-Essence is amazing. You apply it after a toner and before a serum. It helps to boost your serum. It's on the pricier side ($39.95) so I'd pick this up on sale. I'm currently on my 2nd bottle. I adore using sheet masks, but find them sometimes difficult to fit into my day as they work best when you have them on for 20-ish minutes. 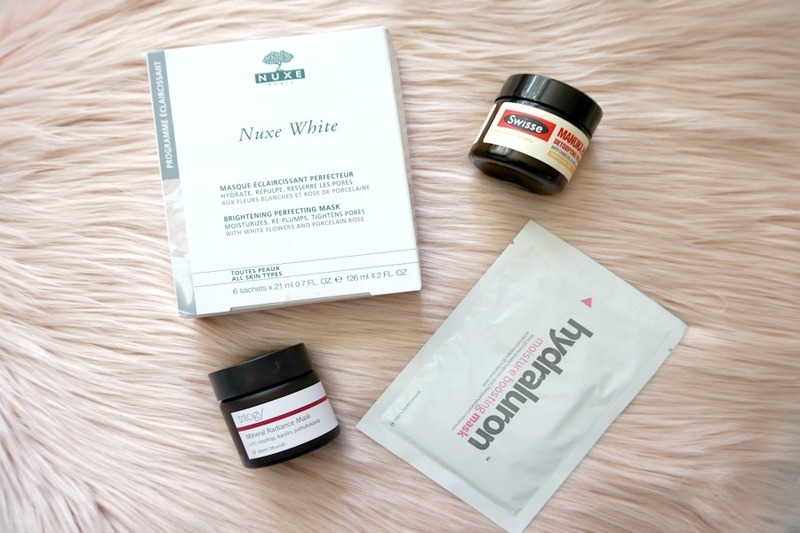 I've been using the Nuxe White Brightening Perfecting Mask* and I adore them. They're a tissue sheet mask that always leaves my skin feeling soft and looking glowy. The Indeed Laboratories Hydraluron Moisture Boosting Mask is another sheet mask that leaves my skin feeling plump, glowy and radiant. If you're looking for an inexpensive mask, then the single sachets from Montagne Jeunesse (not pictured) are fantastic. They've got so many different ones available for every skin type and concern. Clay based masks are fantastic for detoxing your skin and helping reduce congestion. If you have normal to dry skin then I'd suggest buying the Trilogy Mineral Radiance Mask. * Even those it's a clay based mask, it doesn't leave my skin feeling tight or dry. It contains sweet almond oil and rosehip oil to keep your skin hydrated. If you have normal to oily skin then the Swisse Manuka Honey Detoxifying Facial Mask is perfect for you. It contains kaolin and charcoal to help detoxify, while also using manuka honey which is a great antibacterial ingredient. The Antipodes Aura Manuka Honey Mask is a product that's a cult favourite among bloggers and is worth picking up as it's on the pricier side ($48.99). Body products are included in the sale, so it's the perfect time to stock up on body wash and body moisturiser. 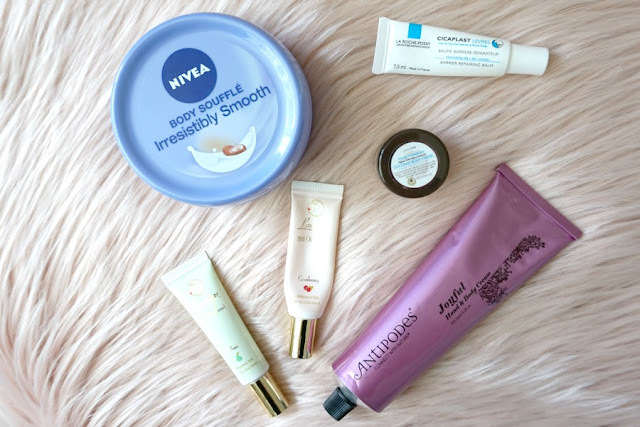 I'm currently using the Nivea Irresistibly Smooth Body Souffle* and it's INCREDIBLE! I'll use it in the morning and even after my bedtime shower, my skin still feels hydrated and smooth. The PureTan Pure Moisture Coconut Body Creme is a pricey moisturiser that I always pick up at the 40% off sale. It smells amazing and is incredibly hydrating. Another product that I adore is the Antipodes Joyful Hand & Body Cream. It has a beautiful floral scent that stays all day on my skin. It's pricey, so I would only pick this up on sale. I'm obsessed with Lanolips (I've bought 4 already this year and it's not even the end of January) so I suggest buying one of each flavour!! They're amazing. And lastly I've been loving the La Roche-Posay Barrier Repairing Balm on my lips to keep them soft and smooth. What's on your wishlist for the Priceline skincare sale? If you've tried any of my recommendations, would you recommend them too? What?! I must go tomorrow. And perfect timing because I just got a $5 voucher from them today! I planned on getting the Montagne Jeunesse masks, though I might also look into other goodies too! Great picks!!! I haven't even heard of half this stuff until now! I think I'll be needing a new day cream soon and maybe something to exfoliate.